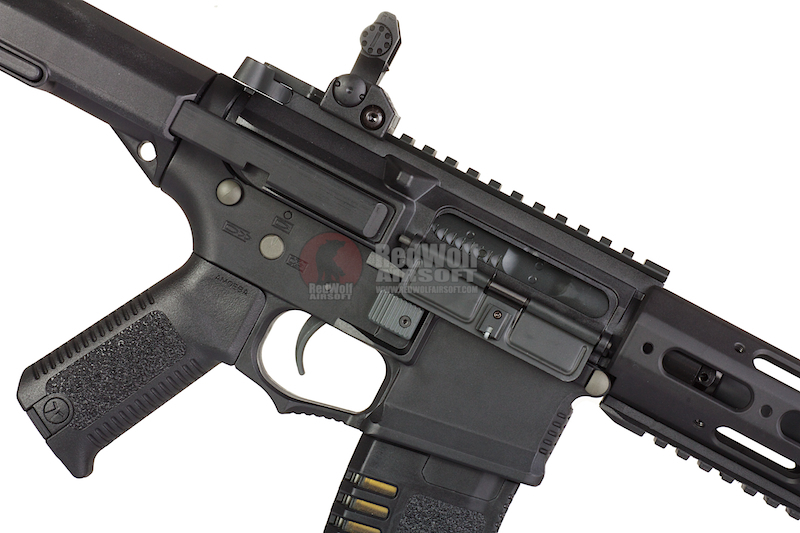 Closely resembled the AAC Honey Badger PDW. Works with the ARES / Amoeba Electronic Gearbox Programmer. Battery is stored in a small compartment of the stock. 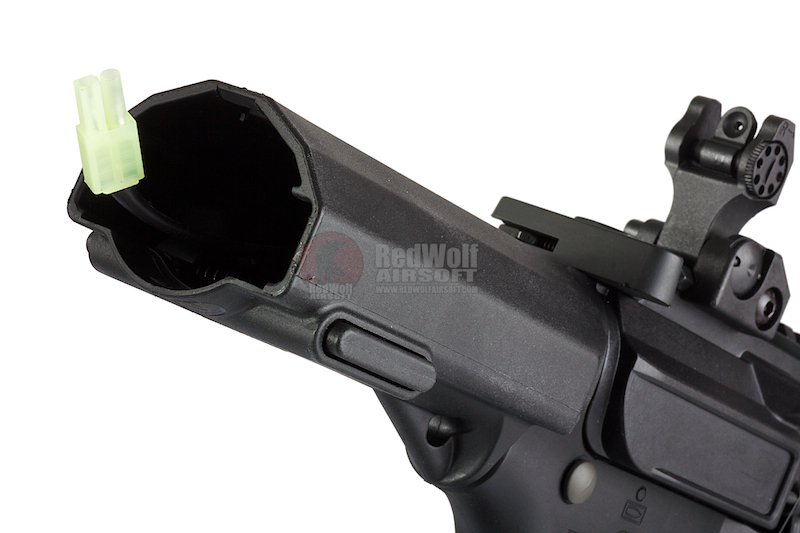 Magazine Compatibility - Ships with 300 Round mid-cap magazine. 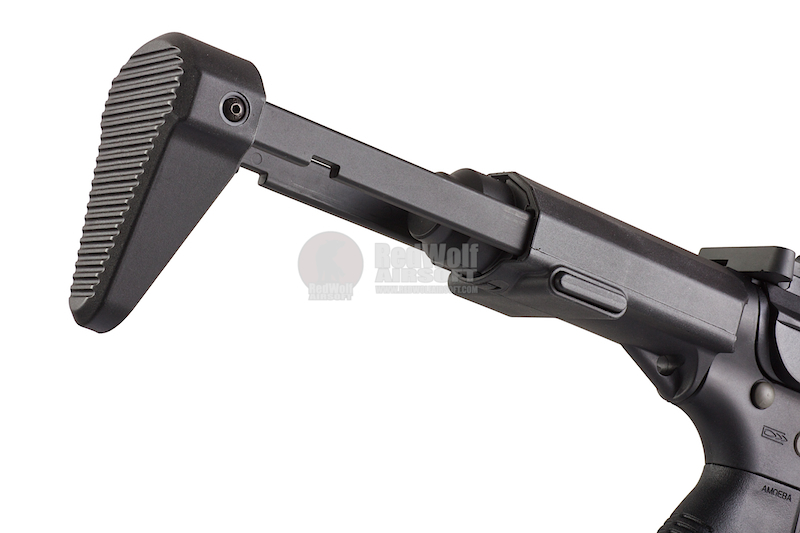 Compatible with Matrix, G&G, Tokyo Marui and other compatible M4 / M16 Series Airsoft AEG Magazines. 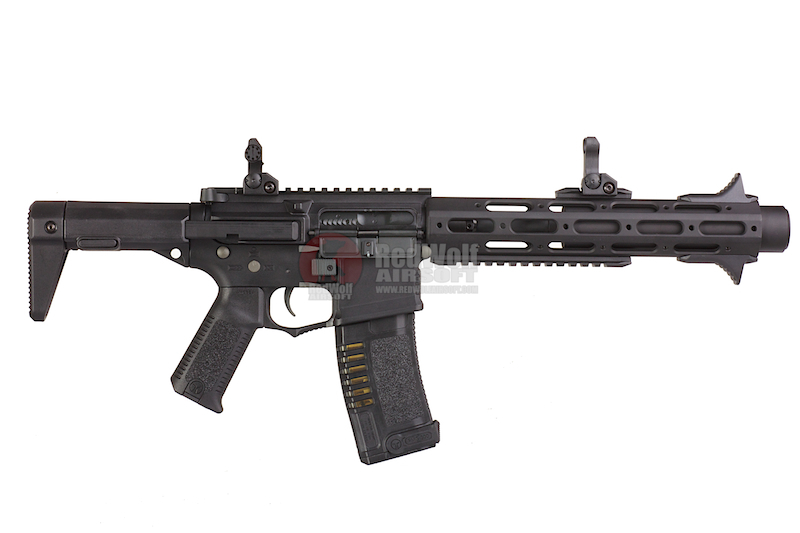 A lot of people have gone and customized their own version but ARES are the only company that have listened and set off to design the AM-013 and AM-014 which closely resembled the AAC Honey Badger PDW. It fits in with their Amoeba line as their receiver hasn't changed but they've managed to add the stylish HB extendable stock, a free float hand guard and a mock suppressor protruding out the front. 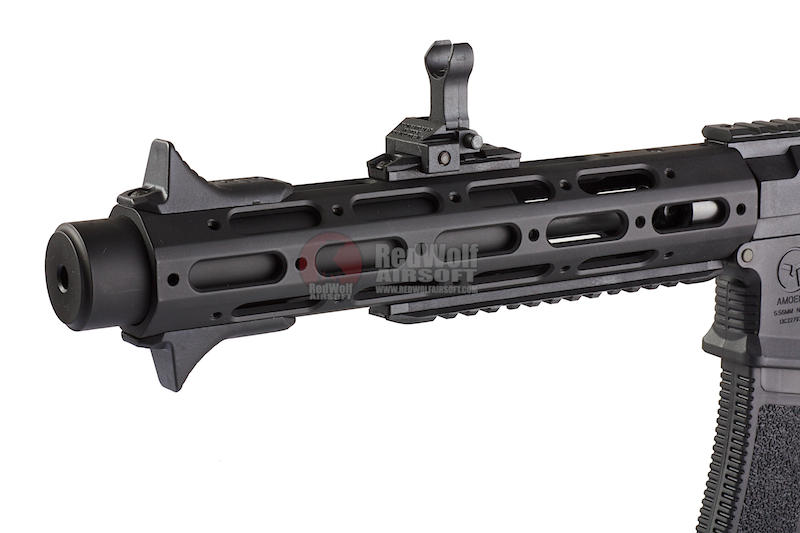 Sure the hand guard is a little longer, but we are sure ARES will come out with a shorter hand guard version. It works with the ARES / Amoeba Electronic Gearbox Programmer for ARES Electronic Firing Control System Gearbox so you can set your AEG to burst fire if you prefer. The trigger response is excellent and works best with a 7.4v PEQ battery which is stored in a small compartment of the stock. It's a little fidgety, but it fits perfectly so you don't get any rattling. AMOEBA AIRSOFT is a brand new airsoft company aims to design and develop innovative products to suit new market trend. Here, they will bring you to a virtual world and start a mission impossible. 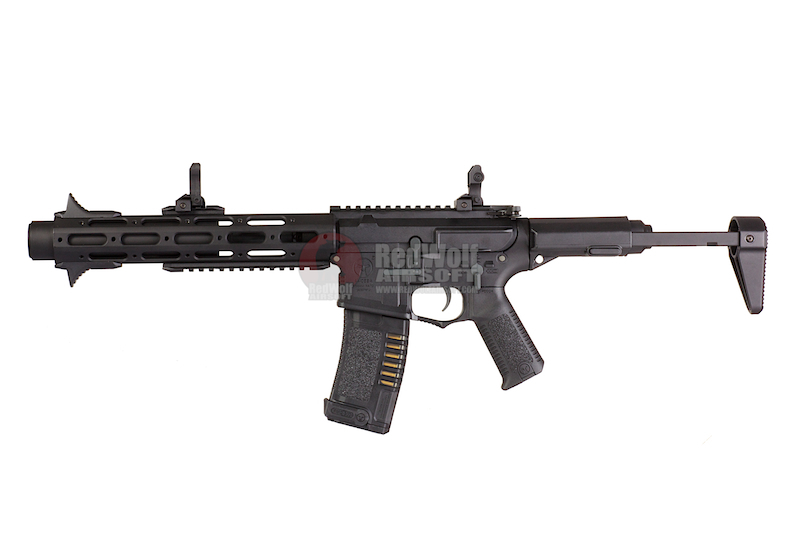 AAC Honey Badger PDW is an CAR-15 based assault rifle / PDW in caliber .300 AAC Blackout produced by Advanced Armament Corporation, a subsidiary of Freedom Group. The weapon is named after the honey badger. Both the rifle and the caliber used were developed in close cooperation with American special operations units to create a suitable and effective replacement for the HK MP5 and similar CQB weapon systems. The rifle is designed to be very convenient for military use where the CAR-15 platform is issued and in common use, since many similarities would exist in the fire controls, weapon manipulation, and magazines. x1 x1 ARES Amoeba AM-013.